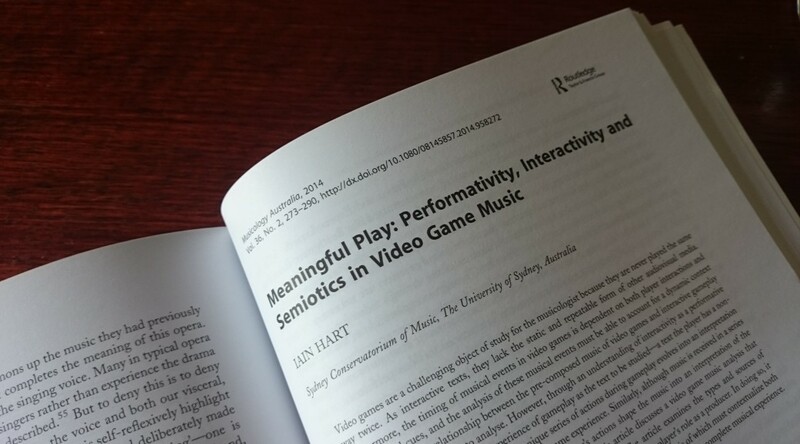 My article “Meaningful Play: Performativity, Interactivity and Semiotics in Video Game Music” has been published in Musicology Australia, the journal of the Musicological Society of Australia. It follows directly from a paper I gave at the Performative Voices conference at the University of South Australia in 2012, and which I also gave (slightly revised) at the Ludo 2013 and MaMI 2013 conferences. Through an understanding of interactivity as a performative act, we can treat the musical experience of gameplay as the text to be studied—a text the player has a non-trivial role in creating. The player’s unique series of actions during gameplay evolves into an interpretation of the designers’ complete, preconceived game experience. Similarly, although music is received in a series of unique contexts during gameplay, the player’s actions shape the music into an interpretation of the musical experience envisioned by the composer… Video game music exhibits a twofold semiosis, the analysis of which must contextualise both the music’s initial composition and the player’s interactivity in relation to the complete musical experience. The article can be found online here. If you have institutional access, go have a read! Previous PostAustralian-made games on SteamNext PostRe-Welcome!